I’m not much of a “joiner.” I don’t say that with any amount of pride; in fact, I consider it one of my major character flaws. It’s one of the major reasons that you don’t see ADE, GCT, or any other alphabet soup of letters in any of my email signatures or bios. If you happen to know me, and I seem to play well with others, then it’s most likely that I’ve gotten to a place where I feel comfortable being a part of the group. Being a part of the Ed Tech Baton is one of those groups that feels incredibly comfortable for me. It’s a “community first” collaboration of educators from around the world, focused on sharing great examples of learning with technology, not celebrating individuals. Being one of the founding members of the #michED chat community, this concept speaks to me; there’s currently a wave of educational technology celebrities, rockstars, and “all star groups” rising in prominence, and I feel at times that it over looks the quietly competent educators that I see everyday in the classroom. The focus on the learning, not the individual, makes the Ed Tech Baton concept fascinatingly simple. I’m not sure how I stumbled across Ed Tech Baton, but I immediately signed up in an attempt just to uncover the individuals behind it so I could send them an email to say “thanks” for creating such a wonderful opportunity. Even then, they wouldn’t reveal everyone behind the project, so I bought in, signed up, and I’m excited to be “carrying the baton” tomorrow! The concept is simple; Everyone participating gets to “run” for a day, and posts images to a shared Ed Tech Baton Instagram account where others can follow, share, and gather ideas for using technology in the classroom. 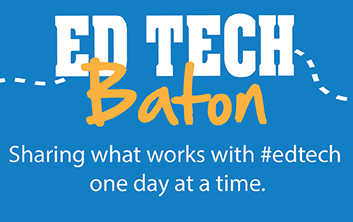 The images will also be shared out automagically to the Ed Tech Baton Twitter account and their Facebook page. It’s a curated and syndicated stream of people celebrating what’s important to them through a few slices and moments of a single day, with the baton being passed to another member of the community the following day. I’m excited to share moments from my school district on October 17th, and since I’m not in a classroom of my own, I’ve enlisted the help of many teachers throughout my district. I’ll be updating this post with the images, so I have my own archived day of carrying the baton, but you’re certainly welcome to check out the Instagram account, or go and sign up to carry the baton yourself. The rules are fairly straightforward, and I hope to capture a few playful shots to share.